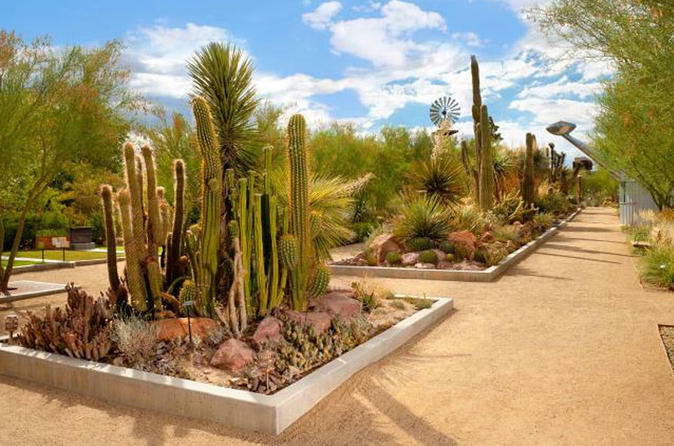 With your full-day admission ticket to the Springs Preserve, you’ll discover the ‘birthplace of Las Vegas,’ learn about Nevada history and see Mohave Desert wildlife habitats. Spend as much time as you like at indoor and outdoor exhibits, museum galleries, hands-on demonstration sites, interpretive trails and more. Origen Museum: As the interpretive focal point for history at the Springs Preserve, the Origen Museum features an indoor theater, traveling exhibit space and more than 75 permanent exhibits such as Flash Flood, Land Auction, The Railroad, Native American Settlements and Hoover Dam. Wander the connecting galleries, watch documentary films such as Miracle in the Mojave, see multimedia historical recreations and visit live animal habitats to see Relict leopard frogs, desert iguana, gray fox, Gila monsters and more. NV Energy Foundation Sustainability Gallery: Learn about living a more eco-friendly lifestyle through a bevy of interactive exhibits, children's play areas and an entire house full of sustainable appliances, fixtures and decor. Explore a simulated Las Vegas neighborhood, making your way through areas focused on recycling, composting, alternative energy, sustainable construction and water conservation. Nature Trails: Walk or bike the Springs Preserve's 3.7 miles (6 km) of trails, and follow in the footsteps of ancient natives and adventurous explorers as you meander through 110 acres (44 hectares) of indigenous habitats and archaeological sites. Discover how ranching, railroads and water have all shaped local history. DesertSol: This one-bedroom, one-bathroom solar-powered home was created by the UNLV Solar Decathlon Team as part of the US Department of Energy Solar Decathlon 2013. Check out the ultra-efficient model home's innovations in sustainable home design, including technology, energy and material choices, and learn about its use of solar energy as its only fuel source. Special Offer - Price displayed includes a 20% discount off the local admission price! Book ahead and save! - Book Now!